Now that you are more familiar with the interface, it is time to take a walk and get to know the town around you. Depending on your starting location, you are now inside the local Inn or the city Bank . Inns act as lodging places for travelers who seek shelter to rest safely. They are safe places where you can log out instantaneously. Banks provide a place of storage, also known as the bank box. To open your bank box you must first visit a bank. Most cities have one, usually found in a central location. When you are close enough to a banker or minter NPC, say "bank" to open your box. You can also open it by using a context menu on the NPC. The term Context Menu refers to a menu accessed by single clicking on something (or holding down shift, then single clicking on something, if one has selected the option to handle it that way). Several game mechanics can be accessed this way. A Non-Player Character (NPC) is any character that is not controlled by a player. The term's polar opposite is Player Character. Although not controlled by players, monsters and animals are not generally considered NPCs. Hostile NPCs are sometimes categorized with other creatures or monsters. Typical examples of NPCs include: Bankers, Minters, Healers, Vendors and Guards. You can also pay NPCs for training your Skills up to a certain level. 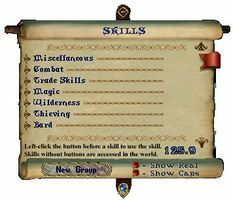 Ultima Online has 58 different skills currently in game which determine the capabilities of your Character. As a new player, you can expend up to 700 points between these however you desire. In order to improve in a skill you simply carry out the associated actions. For example, if you wish to train as a Swordsman, simply fight Monsters with a sword equipped. Likewise, casting a Fishing Pole out into the water is all it takes to become a better Fisherman. Each skill is associated with certain Statistics, which are trained in the same manner. You can usually pay NPCs for training up to a certain level. For example, visit your local blacksmith's shop and you should be able to learn some of their trade via their Context Menus. You will be expected to pay for these services, of course, though the Gold requested is a pittance. The gold amount is 1 GP per 1/10 of skill with the highest amount of skill costing 400 gold for 40 skill points. 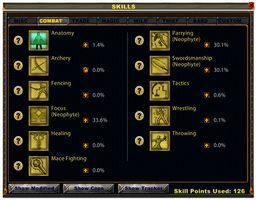 Classic Client - Clicking on the skills icon from the Paperdoll will open a window where you can see the current level of each skill. On this menu, there are small yellow arrows (▲ ▼), or locks, located next to each skill. These indicate whether a skill will increase, decrease or not change at all. To gain in a specific skill, make sure the arrow is pointing up (▲). By default, all skills are set to increase as displayed by the upward arrow next to them. Enhanced Client - Clicking on the skills icon from the Player Quick Menu will open a window where you can see the current level of each skill. On this menu, there are small yellow arrows (▲ ▼), or locks, located next to each skill. These indicate whether a skill will increase, decrease or not change at all. To gain in a specific skill, make sure the arrow is pointing up (▲). By default, all skills are set to increase as displayed by the upward arrow next to them. Dexterity - Determines Stamina and is important for skills such as Snooping and Parrying. Classic Client - Clicking on the status icon from the Paperdoll will open the Character Status Menu where you can see your current statistics. On this menu, there are small yellow arrows (▲ ▼), or locks, located next to each stat. These indicate whether a stat will increase, decrease or not change at all. To gain in a specific stat, make sure the arrow is pointing up (▲). By default, all stats are set to increase as displayed by the upward arrow next to them. The bar displays (from top to bottom) your Hit Points (H), Mana (M) and Stamina (S). from the Paperdoll will open the Character Sheet where you can see your current statistics. On this sheet, there are small yellow arrows (▲ ▼), or locks, located next to each stat. These indicate whether a stat will increase, decrease or not change at all. To gain in a specific stat, make sure the arrow is pointing up (▲). By default, all stats are set to increase as displayed by the upward arrow next to them. Player vs. Player, commonly abbreviated as PvP. It denotes player versus player combat of any kind. Player vs. Environment, commonly abbreviated as PvM or PvE. Simply put, it is the player-controlled character competing against the game world and its computer-controlled denizens. double clicking on a target while in War mode. You can toggle between War and Peace modes by pressing the Tab key. Classic Client - You can set your Peace/War toggle to War by clicking on the Peace button from the Paperdoll. The same way, you can return to Peace mode by clicking on the War button . or by casting a Spell and single clicking on a target. Note that if you are attacked, you will counter attack automatically, whether or not you're in War mode. Skilled spell casters are able to attack enemies, aid themselves and allies, move objects and themselves, create things out of nothing, summon creatures and a whole host of other actions that most people imagine when they think of magic. While some spells require the use of components, or reagents, in order to cast them, others do not. Spells are added to spellbooks by dropping an appropriate scroll onto the spellbook in question. Low level spell scrolls can be purchased from NPCs that are located in town magic shops, while high level scrolls can be found as loot on certain monsters. Classic Client - You can place any spell icon from a spellbook to anywhere on the game window by dragging and dropping the icon: Open your spellbook, put the mouse cursor over the icon, then press and hold the left mouse button and without releasing the button, move the mouse cursor to the new location. You can place any spell icon from a spellbook to a Hotbar by dragging and dropping the icon: Open your spellbook, put the mouse cursor over the icon, then press and hold the left mouse button and without releasing the button, move the mouse cursor to any Hotbar slot. Weapons are any items that can be equipped in a character's hands and then used to do either melee or ranged damage to another target. They are wielded using either one or two hands. Weapons can possess a wide range of item properties, including damage increases, swing speed increases, abilities for leeching hit points or mana, casting various spells automatically upon a successful hit, and many more. Archery weapons feature ranged attacks using expendable ammunition. Some examples are Bows and Crossbows. Fencing weapons are generally bladed and are designed to deal quick, stabbing strikes. Some examples are Daggers and Krysses. Mace Fighting weapons are bulky objects or staves, sometimes with spiky protuberances, that are designed for bashing opponents. Some examples are Maces and Quarter Staves. Practitioners of the Swordsmanship skill favor bladed weapons that are designed for slashing at opponents. Some examples are Katanas and Viking Swords. Throwing weapons can only be used by Gargoyle characters as the Throwing skill is a combat skill unique to Gargoyles. Weight: The weights of items in Ultima Online are measured in stones. The total weight you can carry is determined by your strength. Damage Type: Damage Types is a collective, generic term for the areas in which damage is meted out and armor is designed to resist. Weapon Damage: This is the base damage a weapon can inflict without taking into consideration the armor of the target or the level of the character's skills and stats. Weapon Speed: It specifies the delay between two swings of the weapon in seconds without the Swing Speed Increase or the Stamina bonus. Strength Requirement: It denotes the minimum amount of the strength stat required to equip the item. One or Two Handed: It specifies whether the weapon is equipped on both hands or only the right hand. While two handed weapons do more damage, one handed weapons are much faster and allow a free hand to equip a shield or drink potions. Skill Required: It declares which skill of the character will be used to calculate the damage and the chance to hit. Durability: It denotes how close the item is to breaking or how in need it is of requiring repair. It is comprised of two parts: the current durability and the maximum durability. If both of these values are allowed to reach 0 on an item, the item is destroyed. Classic Client - You can equip a weapon by dragging and dropping the it from your Backpack to your Paperdoll: Press and hold the left mouse button on the weapon and without releasing the button, move the mouse cursor to to your Paperdoll and release the mouse button. Enhanced Client - You can equip a weapon by dragging and dropping the it from your Backpack to your Paperdoll: Press and hold the left mouse button on the weapon and without releasing the button, move the mouse cursor to to your Paperdoll and release the mouse button. Armor is the category of in game items that can be equipped by a character mostly for defensive purposes. It generally has Resistances and other Item Properties used by a character in combat. This distinguishes armor from clothing, which typically does not. Some (but not all) types of armor can also be categorized more specifically by theme. Suits may or may not contain components for each equipment slot. For example, Leather Armor comes with a head covering while most other sets do not. Furthermore, some sets contain "alternative" Female Armor components. Note that all types of armor in a given set come with the same basic resistances. For example, a Platemail Gorget provides exactly the same level of protection as a Platemail Tunic. Armor that is Exceptionally crafted will receive a bonus that is further boosted by your character's Arms Lore skill, while Runic Tools can be used to send the total resistance level far higher. Some forms of armor are "medable," meaning they do not affect your use of the Meditation skill when worn. Elven armor can only be worn by Elves. The same way, Gargish armor can only be worn by Gargoyles. 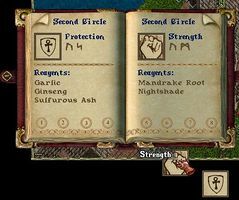 A character's individual resistances are displayed in the Character Status Menu or Character Sheet. For Humans and Gargoyles, resistance is cumulative up to a maximum level of 70% in all five areas. However, Elves enjoy an Energy Resistance maximum of 75%, not 70%; the rest of its resistances are capped at 70%. Classic Client - You can see your current total resistances by clicking on the status icon from the Paperdoll which will open the Character Status Window. The symbols represent (from top to bottom) the total physical, fire, cold, poison and energy resistance. You can equip a piece of armor the same way you equip a weapon: by dragging and dropping the it from your Backpack to your Paperdoll. from the Paperdoll which will open the Character Sheet. Moongates are magical warp portals connecting two or more places together. The most common Moongates are the constant Moongates next to or in every major town, all of which connect to each other. A character who steps into a non-player-created moongate is presented with a menu of destinations - all of the static moongates on the server. Players with sufficient Magery may also temporarily create Moongates linking only two areas together utilizing a Rune Stone. 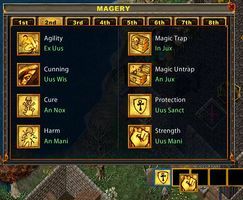 Rune Stones are one of Ultima Online's most useful items: When used as the target of the Magery spell Mark, the caster's current location is stored within. Anyone with access to the rune may then travel there instantly using the Magery spells Recall and Gate Travel, or Chivalry spell Sacred Journey. They may be purchased from NPC Mage Vendors. Runes weigh one stone each and cannot be stacked. However, once marked they may be placed within a Runebook. The books also weigh a single stone but do not gain weight no matter how many runes are placed within, and can furthermore be used to store Recall scrolls for those characters without magical capabilities of their own. Once marked, a rune will change color according to the Facet it now leads to. In addition, it will be named according to the area within that facet. You may rename runes by double clicking on them. The facet before there were others, Felucca is the original. This facet allows non-consentual PvP and the stealing from other players. Player housing is allowed in Felucca. Resources are double here, and it is the only facet in which a power scroll can be obtained at a Champion Spawn. Trammel was introduced with the Rennisance expansion. Non-consensual PvP is not allowed, nor are players stealing from players. Player housing is allowed in Trammel. Every facet except Felucca uses the basic Trammel rules set, with modifications. Ilshenar was introduced with the Third Dawn expansion. Player housing is not allowed here. There are several dungeons (though some players refer to the entire map as "one big dungeon"). Paragon monsters and certain artifacts spawn here. One cannot use the transportation spells Recall, Gate Travel, or Sacred Journey to get into Ilshenar. Entrance to Ilshenar is exclusively through moongates. Ilshenar's gates are located at the Shrines of Virtue and the Shrine of Chaos. One can, however, leave Ilshenar using Recall or Sacred Journey (but not Gate Travel). Malas was introduced with the Age of Shadows expansion. Its primary features are the cities of Luna and Umbra, lots and lots of player housing, and the Dungeon Doom. There are several unique locations as well, such as Grimswind Ruins. The Tokuno Islands are 3 islands introduced with the Samurai Empire expansion. The islands are Asian themed. Player housing is allowed, but only to a limited extent, thus making real estate there very expensive. There is one city, Zento. It has several dungeons. Use of the transportation spells Sacred Journey, Recall, and Gate Travel is unrestricted in Tokuno except in the dungeons. Ter Mur was introduced with the Stygian Abyss expansion. It is primarily a dormant volcanic environ interspersed with lush vegetation and rivers. Inhabited natively by Gargoyles, their ruler is Queen Zhah who holds court within the walled Royal City. Other than a moongate, Ter Mur can be reached by traversing the Stygian Abyss Dungeon from Britannia. This page was last modified on 10 August 2012.